Homespun Towels 2 - Fiber & Towel Fabric Packs This item is on sale. SHOP OVERSTOCK .. From Cathy Jean Designs for The Victoria Sampler, this FABRIC pack contains one Fat 1/4 yard each of Vintage Green Check and Vintage Green Striped homespun linens .. both fabrics seen in the photo of chart here. ALSO INCLUDES the fibers used in this design of the same name: Kreinik black #4 braid; GAST Gingersnap, Grape Leaf, Maple Syrup, Ohio lemon Pie, Straw Bonnet, Tin Bucket, Baby Spinach, Black Crow, Copper, Flax, Grassopper, Brandy, Lexington Green, Nutmeg & Woodsmoke: Weeks Dye Works Pelican Gray, Squash, Chestnut; as well as Micro Mini Round buttons and Five Petal Flower Buttons. Homespun Towels Fiber Emb Pack This item is on sale. SHOP OVERSTOCK .. From Cathy Jean Designs for The Victoria Sampler, this fiber pack contains all fibers needed to stitch the two designs in this leaflet of the same name: Kreinik #4 Braid #010HL; DMC Floss #3752; Gentle Art Sampler Threads in Baby Spinach, Dungarees, Harvest Basket, Maple Syrup; Oatmeal, Cornflower, Dried Thyme & Straw Bonnet; Weeks Dye Works in Chestnut, Marigold & Aztec Red; Micro Mini Round Buttons in red and in blue. Homespun Wee Ones - Love You So This item is on sale. FROM STORE OVERSTOCK, NEVER USED...From Homespun Elegance, stitched on 30 count Cream linen using DMC floss, Gentle Art Sampler Threads, and Weeks Dye Works. 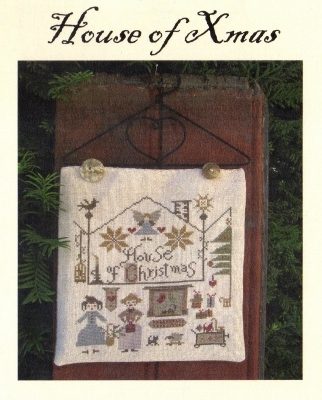 Stitch count for Sampler - 60 x 88; Door Hanger - 21 x 35; Ornament - 26 x 33. Homespun Wee Ones - What Are Boys This item is on sale. FROM STORE OVERSTOCK, NEVER USED...From Homespun Elegance's new line - Homespun Wee Ones. Shown stitched on 27ct Cream linen using DMC floss. It is mounted in a 4" X 8 1/2" Shabby Chic hand-painted Chocolate/Blue Scallop Edged frame. Homespun Wee Ones - What Are Girls This item is on sale. FROM STORE OVERSTOCK, NEVER USED...From Homespun Elegance's new line - Homespun Wee Ones. Shown stitched on 27ct Cream linen using DMC floss. It is mounted in a 4" X 8 1/2" Shabby Chic hand-painted Cream/Taupe Scallop Edged frame. Homestyle Potholders & Towels This item is on sale. FROM STORE OVERSTOCK, NEVER USED, chart is in EXCELLENT condition. From Stoney Creek, this booklet contains 12 kitchen designs featuring towels and potholders. Hon E. Bear with Bees This item is on sale. From Past & Present Needleworks, published ? Out of print chart is in EXCELLENT condition, appears never used, with black mark on inside cover (does not obstruct charted design) and price sticker on front cover. Honest Santa This item is on sale. FROM STORE OVERSTOCK, NEVER USED...From The Sweetheart Tree, this sweet pup has gotten all tangled up in Christmas lights but you just know from the angelic look on his face that the tangled mess wasn't his fault! All Teenie Tweenie patterns include the embellishments for proper finishing so these adorable mini-Christmas lights will be included. Honor's Guard This item is on sale. FROM STORE OVERSTOCK, NEVER USED...From Fouroaks Designs, stitched on fabric of your choice using Needlepoint Silks #993. Stitch count is 192 x 92. Hoo's There? This item is on sale. Hooked On Grandchildren This item is on sale. FROM STORE OVERSTOCK, never used, in EXCELLENT condition. From Handblessings, you love them, you fill them with sugar, and you send them home to mom & dad! This design shown on 28ct Mushroom Lugana using Gentle ARt Sampler Threads and has a stitch count of 186 x 66. The boy & girl stick figure charms as well as the heart charm are included with the design! Hooked On Purses Bags and Totes This item is on sale. FROM STORE OVERSTOCK, NEVER USED, chart is in EXCELLENT condition...From Handblessings, once you've been 'hooked on shoes', it's time to get hooked on the rest of your accessories! The chartpack comes WITH the 3 silver tone charms that are used to embellish the design. Stitched on 28ct Miracle Mint Lugana using ThreadworX floss with a stitch count of 74 x 96. Hooked On Teaching This item is on sale. FROM STORE OVERSTOCK, NEVER USED...From Handblessings and dedicated to the teachers who guide and encourage our children. The design is shown stitched on 28ct White Lugana using Weeks Dye Works and has a stitch count of 104 x 59. The charms are included in the chart pack and symbolize some of the subjects taught such as history, languages, and science. Hooray For The USA This item is on sale. FROM STORE OVERSTOCK, NEVER USED...From Val's Stitchin Stuff, this little snowman is proud to declare his patriotrism. Stitch count is 45w x 70h and shown on 28ct Creek Bed Brown hand-dyed linen using Weeks Dye Works (DMC/Anchor conversions given). Buttons used are from Just Another Button Company. Hoot This item is on sale. From My Mark, this wise bird is stitched on 28 count White Lugana using Weeks Dye Works Lilac, Kohl, Morris Blue, Cappuccino. Stitch count is 77 x 65. Hooters Pin This item is on sale. Hope This item is on sale. FROM STORE OVERSTOCK, NEVER USED...From Heirloom Embroideries, this absolutely lovely design uses Cross Stitch, Satin Stitch and Diamond Rhodes stitches. The size of the design is 113 x 77 and is stitched with Dinky-Dyes silk (included in the available silk pack) DMC perle cotton #12 712. Mill Hill petite beads 42028, & Mill Hill Glass Treasures 12118. Hoppy Spring This item is on sale. From Lorri Birmingham Designs, out of print chart is in EXCELLENT condition, appears never used, with no markings of any kind. Hospitality This item is on sale. FROM STORE OVERSTOCK, NEVER USED...From Erica Michaels, out of print chart is in EXCELLENT condition, with no markings of any kind and price sticker on front cover. Hospitality of Christmas This item is on sale. FROM STORE OVERSTOCK, NEVER USED...From Homespun Elegance and shown on 28ct Cream linen that has been coffee dyed. Included WITH the chart pack is an Olde Brass Pineapple button. Stitched with DMC floss, stitch count is 68 x 47. Hothouse Blooms This item is on sale. House For All Seasons, A This item is on sale. From Astor Place, out of print chart is in EXCELLENT condition, appears never used, with no markings of any kind and price stickers on front cover. House Of Xmas This item is on sale. FROM STORE OVERSTOCK, NEVER USED...From Nikyscreations, shown on 32ct Natural or coffee dyed linen with a stitch count of 100 x 109. Uses DMC floss. House Sampler 1 This item is on sale. FROM STORE OVERSTOCK, NEVER USED...From Joy Of The Needle, chart is in EXCELLENT condition, with no markings of any kind and price sticker on front cover. FROM STORE OVERSTOCK, NEVER USED...Out of print chart is in EXCELLENT condition, with no markings of any kind and price stickers on fron cover.